It can start off as a sudden explosion of white and black wings rising from a hillside, or sometimes just a slim white funnel rising higher and higher until it mushrooms into a blast of deafening honks and beating wings that fill the sky and compel those nearby to gaze upward in absolute awe. 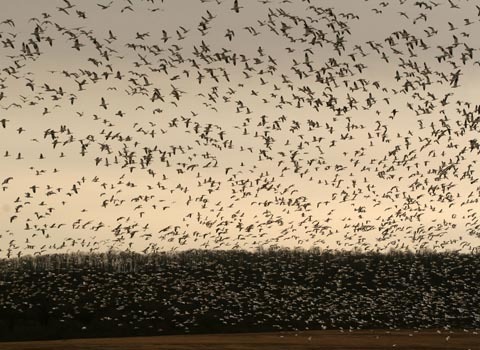 For those who have been to Pennsylvania’s Middle Creek Wildlife Management Area the sight of thousands of Snow Geese taking off at once is unforgettable, and for those who have seen a take off before it’s what brings them back and no visit is complete until they get to see the geese take to the air en masse. 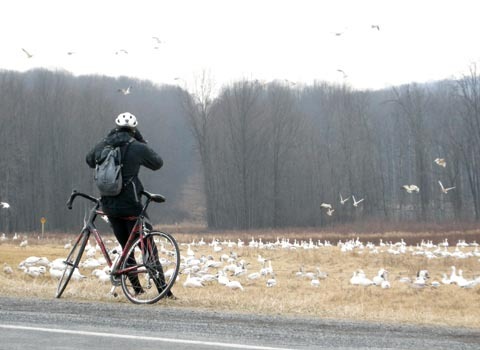 A biker checks out the geese. Middle Creek is located in Lancaster and Lebanon Counties, and is owned and managed by the Pennsylvania Game Commission. The area within Middle Creek comprises of a 400-acre lake and some 6,000 acres of woodlands and agricultural fields. The main concentration of geese is at Willow Point, which is a nice 10-minute walk from the parking area down to the water where there is a excellent view of both open water and surrounding hillsides and fields. Talk about a gaggle of geese–the open water and hillsides ripple with white feathered bodies. There is constant motion and honking as the geese wander and feed, swim and preen and flap their wings at each other. In fact, the word ”gaggle” has its origins in the 15th Century Middle English verb, “gagel”, or the noun, “gagelen”, both of which arose as mimicry of the sound geese make. For some fun etymological history click here. Also, the word gaggle only applies when geese are on water or on the ground; once geese are airborne they become a flock or a skein. 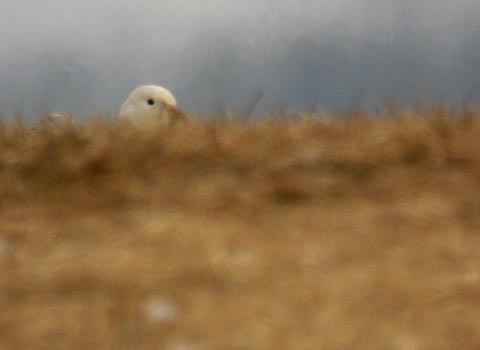 Even while wandering, bathing, preening, and foraging, the snow geese continued their ”gagelen” as they communicated various bits of information from one end of the hillside to the other. 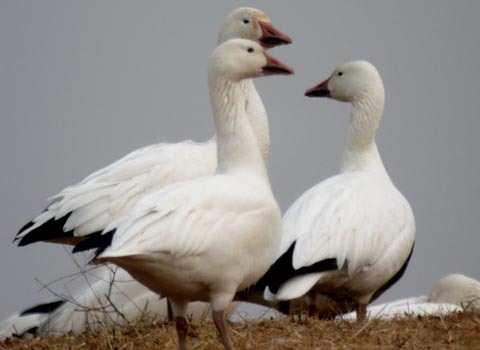 Although, as Snow Geese calls sound to me more like honks most of the time and not so much like gaggling, I might suggest an alternative word–”honkle”. There’s a honkle (noun) of geese on the hillside. The fox had the geese all a-honkle (past passive participle). The hills are a-honkle (descriptive adjective) with the calls of geese. Take your pick. Either way, the honking or gaggling of geese in flight is a beautiful sound that evokes a surge of yearning and nostalgia, and makes me envy the Snow Geese that ancient connection they still share with our Earth. In late February Snow Geese begin moving up from as far down as South Carolina, gathering in numbers until a gaggle may reach as many as 100,000 geese and 5,000 swans flood the Middle Creek landscape at one time. The northward movement of the geese continues until mid-April, the best time seems to be somewhere in mid-March. It’s not an exact science as to when the number of geese will be at its peak but the thawing of the ice-cover at Middle Creek seems to be the key indicator as to the heavier accumulation of waterfowl, especially if southerly winds are blowing. For a daily update on geese and swan numbers and activity go to the PA Game Commission’s website home page. There select “Middle Creek/Pyamtuning” listed on the right sidebar, then select, “Waterfowl Migration“. 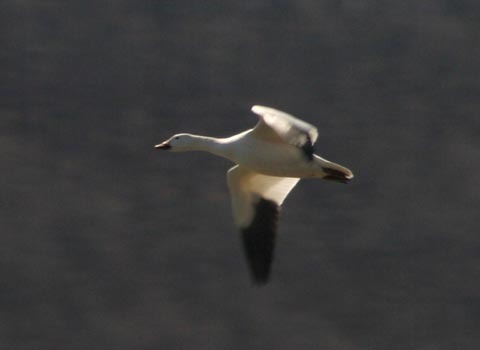 Snow Geese are dimorphic and come in either the conventional white or the more unusual ‘blue’. 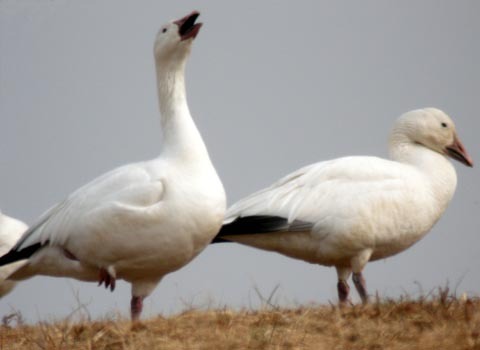 It is the Greater Snow Goose (Chens caerulescens atlantica) that comes to Middle Creek, while the Lesser Snow Goose (Chens c. caerulenscens) is a western subspecies. Both types winter in the United States and fly north to breed in the arctic and subarctic of Canada. 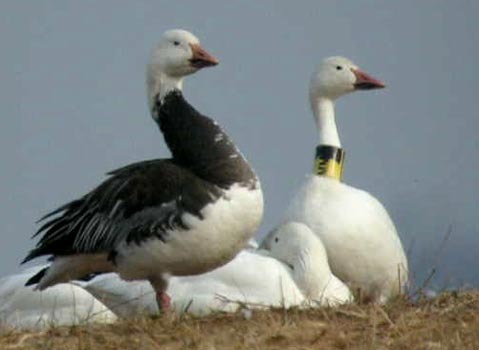 The white goose was most likely banded by the Canadian Wildlife Service (CWS). Believe it or not, it used to be that Middle Creek saw nary a snow goose or swan. In fact, it wasn’t until the 1990’s when the first Snow Geese and Tundra Swans made their appearance on the scene at Middle Creek and other inland areas of Pennsylvania. The first Snow Geese came to Middle Creek in 1994. 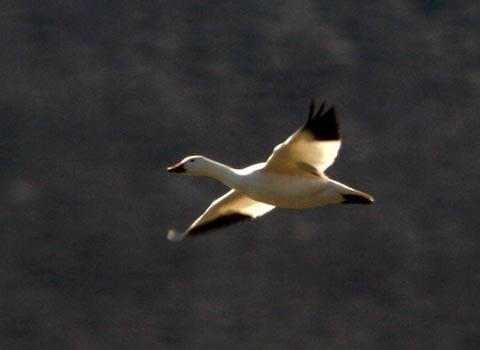 There was a time when the populations of Snow Geese, in general, were nothing to gawk at but climate changes in the 60’s and 70’s, transformation of coastal wetlands into agricultural industries, and wildlife refuges that sought to encourage increase of numbers of waterfowl for hunters have increased both the Eastern and Western populations of Snow Geese. Now the numbers of these birds are too vast to prevent degradation in what remains of their wetland habitats, and neither natural predation on the geese, nor hunting make neither ding nor dent in curbing the populations of geese. There are several sources that discuss this issue in detail but if you would like to see some wonderful photography along with the whole story behind the Snow Geese population explosion, please check out Birder’s Lounge. Meanwhile, Middle Creek Wildlife Area’s provision of open water and plentiful food sources in the cultivated fields that were originally intended for Canada Geese and other waterfowl make Middle Creek one of the prime staging areas in the Atlantic Flyway for both Snow Geese and Tundra Swans during migrations. Despite the issues of concern with the excessive gaggles and honkles of Snow Geese, it’s impossible not to enjoy the immensity and great sound of their presence. That morning, as I stood at Willow Point, enjoying the camraderie of others who had gathered to enjoy the arrival of the geese, I got into a conversation with a fellow Middle Creek Snow Goose fan, who had been bringing his girls there since the 1960’s. The kids were now in college but he still came over on the weekends to see the geese. Then one of the resident Bald Eagles left its perch. We could hear it; the first few honks of alarm, which, as more and more geese took up the call, would swell into a chaos of honks, as snow geese rose off the lake in a cloud of white. No one spoke. This wasn’t a moment for words. Over the lake it was a cyclone swirl of beating wings, a grand gaggling chorus of honks. Eventually, as the threat of the eagle passed, the honking eruption faded. “Well, now I can go home. I’ve seen what I’ve been waiting for all morning,” announced my companion. That sums it up very well for anyone who has seen a grand gaggle Take Off and the sky just a-honkle with geese. It’s what I’ll be looking forward to again next year and in the years that follow. Click on this image to see a Take Off in action. You can also click on the sidebar under videos to see other snow geese video clips.